One of the most basic human needs is to feel accepted. In London, where diversity is abundant and individualism embraced, we are blessed to be able to express ourselves. So why, even in this liberal society do we continually strive to adhere to perceptions of normality and shy away from revealing our own differences for fear of being judged? Society’s expectations of how we ‘should’ be, or what we ‘should’ be doing, or what we ‘should’ have achieved by a certain age plays on our subconscious. Perhaps we are not as modern or free as we like to think. We’re bombarded by media reports of horrific hate crimes from every corner of the globe. Their motivations may be as menial as a difference in creed or faith, sexual orientation or political view, the ‘daring’ act of dressing as one pleases, for refusing to conform. Genocide, honour killings, random attacks; all point to the refusal to accept or embrace difference. There are alarming levels of intolerance in this ‘modern’ era. I was in Istanbul when I discovered an idealistic concept of acceptance and tolerance in the most ancient of thoughts, mounted on my sister in law’s wall. Dilek, the eldest of Murat’s five sisters, lives in an apartment block amongst the extended family of her husband. I immediately identified her as she waited for us outside her doorway on our first meeting; she has the same wiry raven-coloured hair and deep brown eyes as her brother. “Welcome! Hoşgeldiniz!” She led us inside, past a huge evil eye charm, up a crumbling staircase and into her modest home. “Please.” She motioned to sit down and disappeared momentarily to prepare Turkish coffee. “What is that?” I asked, pointing to a stone plaque on the muted pink wall. 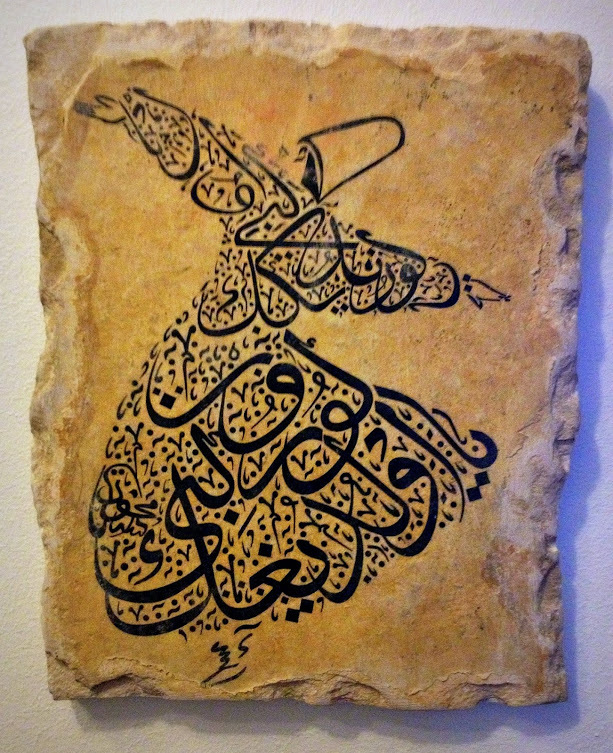 Amid delicate strokes of calligraphy twirled a Dervish, turning blissfully with his eyes closed. He seemed utterly content. “I’m not sure how to translate what is written…Look,” Murat searched on his iPhone and showed me a translation. It doesn’t matter. Ours is not a caravan of despair. Come, even if you have broken your vows a thousand times. Jelal ad-Din Rumi was a Persian philosopher, born in the 13th Century. After his death, his followers founded the Mevlevi Sufi order which uses his poetic prose as inspiration for its teachings. It seems we can look to the not-so-modern wisdom from the heart of the Middle East for ideas of acceptance, tolerance and contentment. In the final weeks of my pregnancy, I couldn’t help but notice another of Rumi’s poems in which he addresses the unborn, whether it be the physically unborn or spiritually is a matter of interpretation. ‘The world outside is vast and intricate.